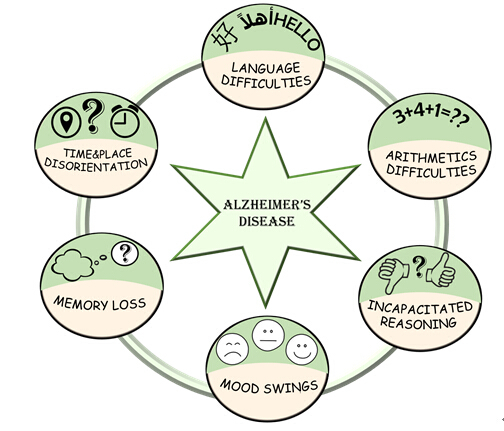 Although Alzheimer’s disease (henceforth: AD) has been around since the 19th century or possibly even earlier and was at a point in time classified as senile dementia, it wasn’t until 1906 following Dr. Alois Alzheimer’s encounter with Auguste Deter at a Frankfurt asylum that the name of the disease was finally coined. Since then, major developments relating to the disease have taken place. In our just published report, we addressed some of the areas of the history, contemporary and prospects of the disease. Some symptoms associated with AD. The history section had to do with the major progress that had taken place since the 1906 of which included the “discovery era”, “the awareness era”, “the progress and hope era” as well as the “the inception of treatment era”. In the contemporary part, we looked into the possible causes of the diseases, with close attention given to tau protein, amyloid beta precursor protein and the genes associated with the diseases such as the APP, PSEN and APOE. A section was also dedicated to the possible environmental factors that can lead to AD. The second part of the present section delved into the approved medications for the disease, of which included Donepezil, Rivastigmine, Galantamine and Memantine. Donepezil, Rivastigmine and Galantamine are classified as cholinesterase inhibitors and though they don’t completely eradicate the disease, they aid in slowing down the symptoms. The future portion of this report was on the current drug trials taking place in search of a cure for the disease. The presently researched drugs include ladostigil, betaine, curcumin, nicotinamide, aducanumab, saracatinib and solanezumab. Although a lot has taken place following Auguste Deter’s diagnosis, a lot more about the disease still remains elusive. One of such area is the main cause of AD. Though scientists have postulated genetics to account for 5% of AD cases, the question that still remains unanswered is “what account for the other 95% of AD cases”? Could it be environmental factors or diet? Or possibly a combination of both genetics and environmental factors? All these were examined in our report. Notwithstanding, the future does indeed look bright in not only understanding the complexity surrounding the disease, but also in finding an effectual treatment, taking into consideration all the progress that has been made up till now.